ZipanguFlyer: AirAsia Japan is officially reborn; first flight June 2015. News about airlines in Japan... plus some flight reports. AirAsia Japan is officially reborn; first flight June 2015. 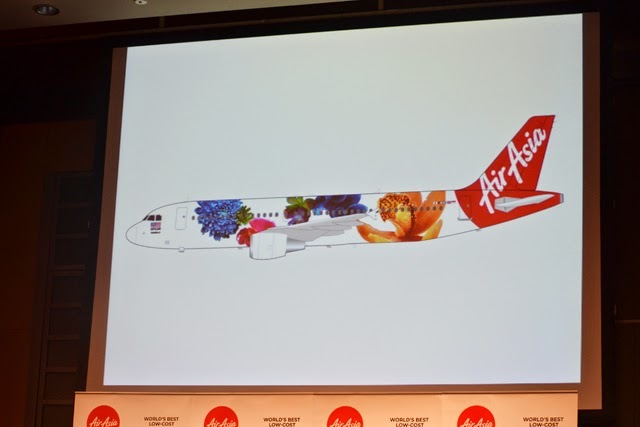 On July 1st, AirAsia Group CEO Tony Fernandes formally announced the launch of AirAsia Japan (Mk II) at a press conference in Tokyo. 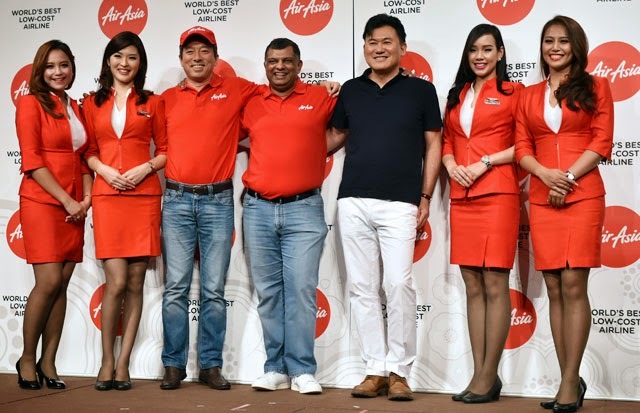 The newest unit of the Malaysia-based pan-Asian LCC group was officially formed on this day, with Mr. Fernandes saying "This is Part 2 of AirAsia Japan's performance, and it will be the last. We will bring Japan and the rest of Asia closer by offering affordable fares." First revenue flight is to take place in summer 2015. An initial capital of 7 billion JPY has been raised from five investors; Malaysia's AirAsia (AK/AXM) accounts for 49%, Octave Japan Infrastructure Fund 19%, Rakuten 18%, Noevir Holdings 9%, and Alpen 5%. According to voting-rights, AirAsia will control 33%, the maximum possible figure allowed under Japan's current airline foreign ownership laws, while Octave will have 28.2%, Rakuten 18%, Noevir 13.4%, and Alpen 7.4%. "We are very excited to return to Japan's skies together with Octave, Rakuten, Noevir and Alpen this time round. I am more confident than ever that AirAsia Japan, led by Odi (Odagiri Yoshinori) with the strong partnership we have with our new investors, will continue to realize our vision to revolutionize the low-cost carrier segment of Japan," Mr. Fernandes said. Octave was incorporated in Japan in May 2014 and its major business is to manage the shares of AirAsia Japan. Rakuten (AirAsia and Rakuten to announce AirAsia Japan on July 1st.) was an IT venture originally founded in February 1997 but now Japan's largest e-commerce firm, with other major businesses including financial services, telecommunications, and professional sports, owning the Tohoku Rakuten Golden Eagles baseball team. Noevir is involved in the cosmetics, pharmaceuticals, and health food and apparel industry. Alpen has been producing a wide range of sports equipment from ski, golf, tennis, marine sports, and baseball since 1972, and it also manages ski resorts, golf courses, and fitness clubs. "If you look around the world, LCCs are stimulating air travel. Their share has grown to around 50% in Southeast Asia, but still only accounts for 3% in Japan. The country is now moving to increase foreign visitors to 20 million by 2020 (when the Tokyo Olympics/Paralympics take place). LCCs will play a pivotal role in surpassing that milestone and will also contribute to the country's economy," Mr. Mikitani said, adding "We are simply a shareholder supporting AirAsia's growth in Asia." Being a personal friend of Mr. Fernandes as well, he also said, "From in-flight entertainment to shopping and payments, the airline market has lots of possible synergies with IT. E-commerce partnerships are possible in the long-term." CEO of AirAsia Japan (Mk II) is Yoshinori Odagiri (New AirAsia Japan names CEO; official launch in April. ), who also headed the first incarnation. The failed 10-month joint-venture (JV) between AirAsia and All Nippon Airways (NH/ANA) has since relaunched as Vanilla Air (JW/VNL) (Vanilla Air launches operations.) under full ANA control. Starting out his aviation career with ANA back in 1987, Mr. Odagiri quit ANA and AirAsia Japan (Mk I) in August 2013, two months after the JV was dissolved (operations under the AirAsia brand continued through October 26th), and joined AirAsia the following month to help re-launch the red brand in the country of the rising sun. "AirAsia Japan has returned," Mr. Odagiri enthused, telling that operations will start as early as June 2015 on domestic routes, followed by regional international flights. An initial fleet of two 180-seat Airbus A320s will be sourced from AirAsia Group's huge order pool, with four planned by the end of 2015. Five will be added each year after that. Asked about their hub, Mr. Odagiri answered "Nagoya was chosen (New AirAsia Japan to be based at Nagoya Chubu Centrair.) for initial registration purposes. We will formally announce a hub in due course," adding "We will start from a non-Tokyo city, but Tokyo is a very big market that cannot be omitted. The (Japanese) government is considering increasing slots at Haneda, and we certainly would like to receive some." He went on to say "We first need to stabilize our business by producing profits on trunk (domestic) routes, and after that, we hope to enter the under-served rural (domestic) markets." Regarding pilot shortages which have plagued LCCs Peach Aviation (MM/APJ) (Peach outlines Summer 2014 mass cancellations.) and Vanilla Air (Vanilla Air cancels 154 flights in June due to pilot shortage.) with mass cancellations, Mr. Odagiri said "We want to plan well, including crew sourcing from the group's other airlines." Speaking about the Tokyo/Narita (NRT/RJAA)-based LCCs struggling to turn profits, Mr. Fernandes commented "Because they're based at high-cost Narita. And Haneda is not far away. If we take a different approach, we believe we can produce a profit in five or six years." He also said "What we learned the first time is that we should work with like-minded people. We make decisions very quickly. We'll do better than partnering with huge established corporations." For the failed first attempt, AirAsia erred in giving majority control to ANA, which made the move mostly to prevent AirAsia from partnering with other companies. As Mr. Mikitani's statement implies, AirAsia is at the controls this time, and the other investors are only supporters. "We are ready to take on this challenge and with great teamwork, we hope to bring AirAsia's successful low-cost business model once again to Japan. Our counterparts in Malaysia, Thailand, Indonesia, the Philippines, and India have seen great and encouraging responses in their markets, and we will work towards the same for Japan. We would like to thank the investors for their belief in us and we look forward to working closely with them moving forward," said Mr. Odagiri. Now AirAsia Japan (Mk II) would be the fifth LCC in an already increasingly crowded market. Is market consolidation (any eliminations?) coming up in the not-too-distant future? Vanilla Air, though wholly-owned by ANA, seems to be the weakest. Further, just of note, Vanilla Air has dozens of staff who were inspired by AirAsia and Mr. Fernandes and said they "would like to work with a future AirAsia," when the first JV was dissolved. Now that their former direct boss (Mr. Odagiri) has moved to restart the red brand, will a brain-drain happen at Vanilla Air? Skymark posts 5.7 billion JPY loss for 1Q FY2014. ANA takes delivery of first Boeing 787-9. Skymark's Airbus A380 order in jeopardy. ANA strongly considers Tokyo – Mexico City. ANA to resume Haneda – Nagoya in October. ANA to receive first Boeing 787-9 on July 27th. Skymark to offer free Wi-Fi on Airbus A330. Fuji Dream orders up to six more Embraer E175s. Jetstar Japan to start Kansai – Oita in October. Air Do celebrates 20 million passengers. Jetstar Japan carries 5 millionth passenger. Skymark to introduce ONE PIECE JET on July 19th. Vanilla Air launches Narita – Amami.